Weight: 1.8 pounds (790 Grams). Trigger Pull: The trigger pull on the ASG MK II is double action only which will make it a bit on the heavy and longer side when compared to a real steel Ruger MK II, it is smooth however and does have a nice satisfying click that sounds like a firing pin being release. 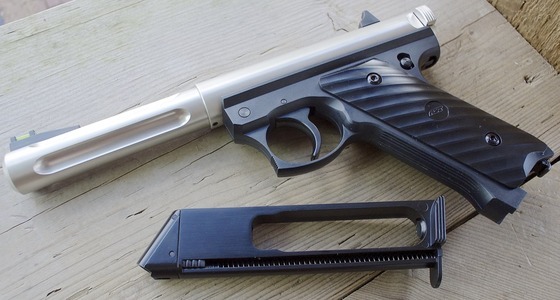 The unfortunate part is that the real steel version is a single action only trigger and one that is super short and light so the contrast between the Airsoft and 22LR version may make this gun not practical is an optional training tool if you win the 22LR version also. Accuracy: This part of the review is yet to be determined as I have not done my Field Test or Shooting tests for this pistol. I will put a link in here when I have done my official Field Shooting Test. For now all I can go on is some feedback from others that have claimed very high fps and excellent accuracy, I am looking forward to finding out for myself! You can watch my Ruger MK I Gas version Field Test Shooting Review to get an idea on how the ASG Ruger MK II version might perform. Build Quality: ASG as usually distributes quality guns, the fit and finish on the ASG Ruger MK II Dual Tone CO2 6mm Airsoft Pistol is very good and there is use of metal where it needs to be like with the internal mechanical parts, the trigger, the safety, the rear fully adjustable sight and the full size drop out metal magazine that holds the CO2 and the Airsoft BB's. Thee MK II version has a metal upper which adds additional weight over the MK 1's plastic upper. 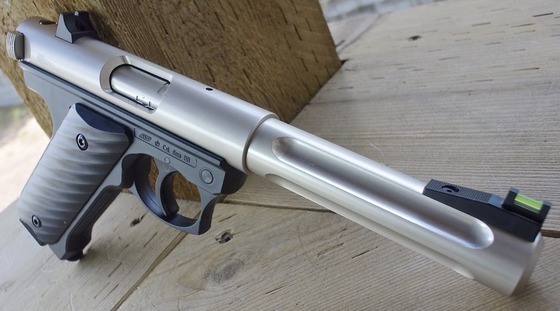 Realism: The ASG MK II is based on real steel Ruger MK II with the fluted barrel in a two-tone finish and looks very close to a real Ruger MK II. 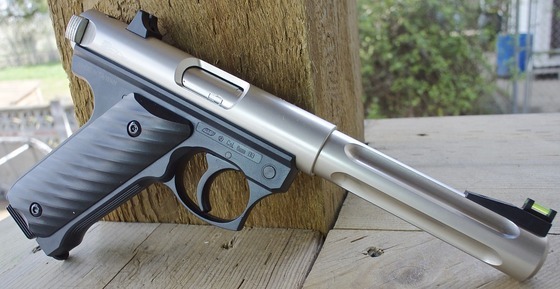 There is no blowback operation or bolt operation so that means that only a double action trigger is possible, this is a bit unfortunate since the real Ruger Mark II has an absolutely smooth and light single action trigger. 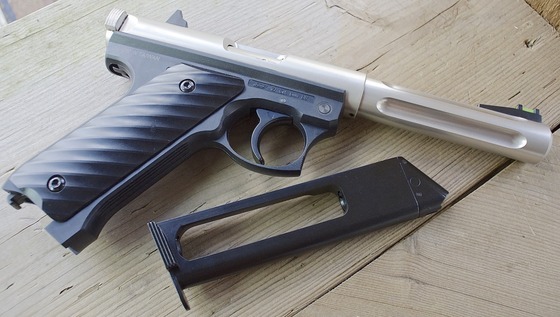 On the positive side you can field strip the ASG Ruger MK II Dual Tone CO2 6mm Airsoft Pistol just like the real version. 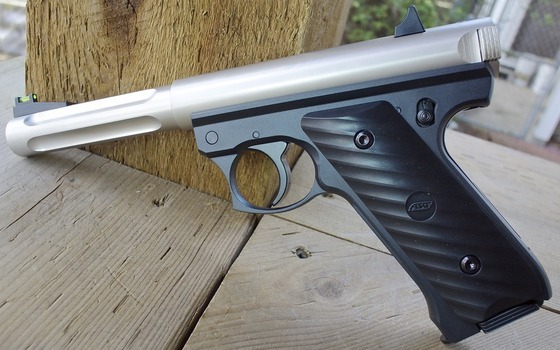 If you own a real Ruger 22LR it would be nice to have for some backyard or basement shooting. Full size all metal drop out magazine that holds the CO2 and Airsoft BB's. Metal upper barrel, Metal trigger, metal safety and many metal internals. Field Strips just like the real steel Ruger MK Series. Plastic sights front and back, plastic trigger. Double Action Only, unlike the real steel version that is single action only. Compared to the my previous review of the ASG Ruger MK I, the MK II for me is a big improvement. 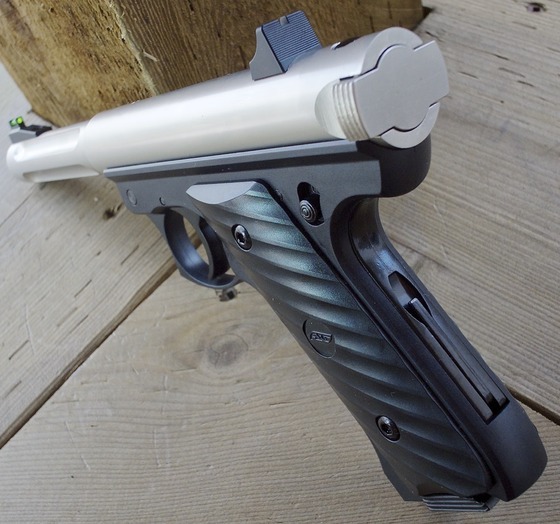 The metal upper barrel assembly makes all the difference in terms of weight and feel and with the two-tone look it is for sure a very attractive looking pistol. I also prefer using CO2 for the increased performance of higher fps and less cool down effect over a gas system. I am hopping my Field test Shooting video goes well and the ASG Ruger MK II Dual Tone CO2 6mm Airsoft Pistol performs on point for me.